Many people get push toys for their baby’s when they are getting ready to walk on their own. This a great for that baby who is cruising and starting to stand on their own but the push toy is also great for that baby who isn’t even walking! Even though my little guy isn’t walking with the push toy just yet, we are using the push toy to play on the floor and enjoying the benefits that come along with it. He plays with the push toy both on his tummy and while in sitting. I always put the push toy up against a stable surface so that it doesn’t roll away and frustrate him too much. 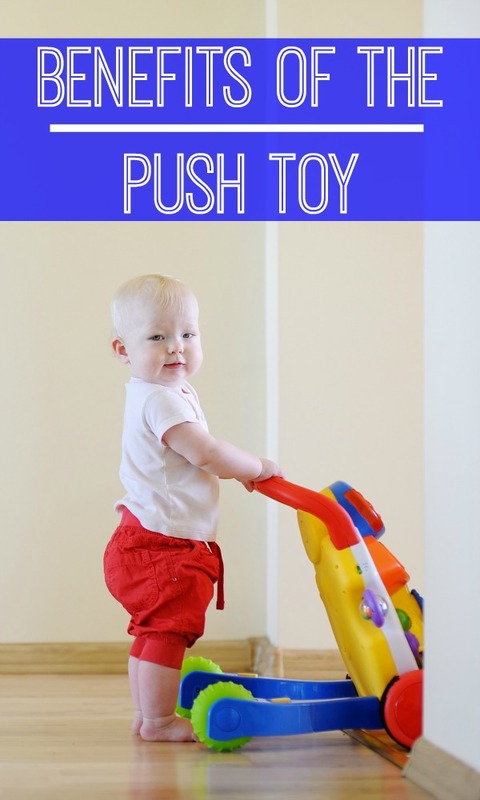 Here are some benefits of the push toy for my guy who isn’t quite walking yet! This post contains affiliate links. I only recommend products I love or personally use. 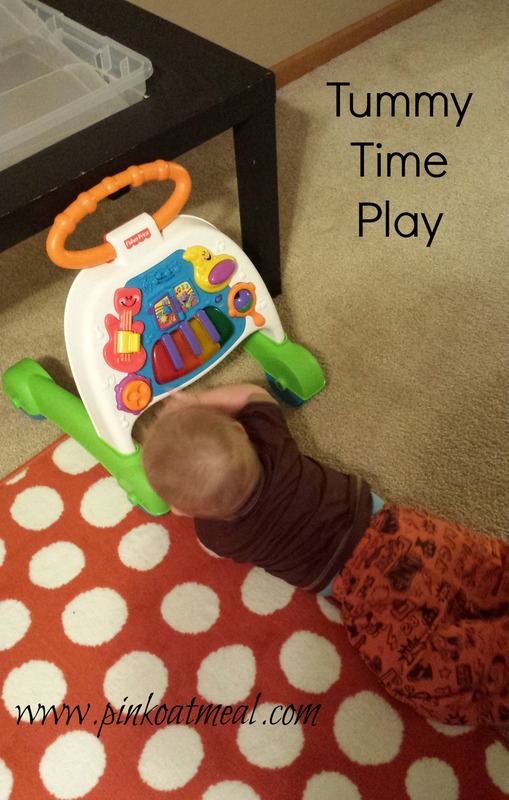 The toy encourages tummy time/floor play. He benefits from being able to push up through his lower extremities and work on weight shifting as he reaches out to play with the toy. Playing with a toy that is in the vertical plane (such as the push toy) encourages strengthening of the shoulder complex, arms, and hands as my little guy has to work a little harder to reach forward and push the different parts of his toys. Playing with the push toy promotes wrist extension. My OT colleagues have filled me in how this is important for handwriting skills in the future! The push toy is at the perfect level so that it is right in front of my little guys face promoting visual attention! The push toy promotes eye-hand coordination when accessing the buttons/gadgets on the toy. The push toy promotes bilateral coordination. 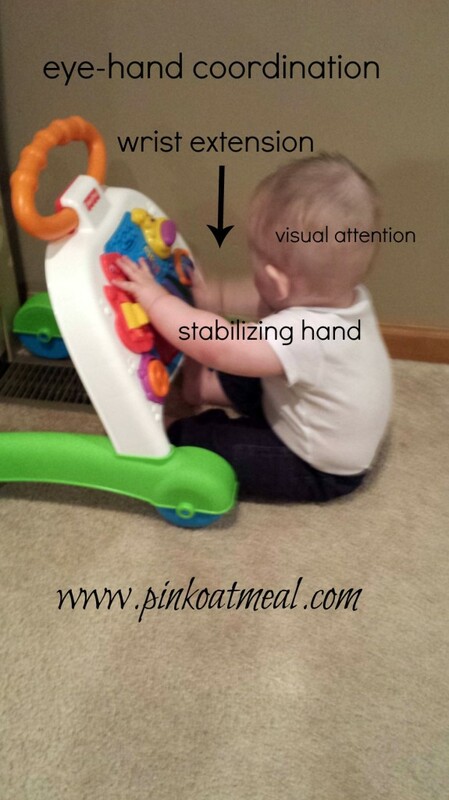 In the picture below C is playing in sitting stabilizing with his left hand and accessing the toy with his right hand. This is coordinated use of both hands. Don’t think that push toys are just for babies that are getting ready to walk. The push toy is an excellent option for those babies that are sitting, rolling, and playing on the floor! Remember, the push toy is different from a baby walker. I know that some people get confused between the two. Be sure to check out my post on baby walkers (the kind baby sits in)and why I don’t recommend them! Favorite baby equipment from a physical therapist and mom of three. Click on each photo to see product details. Affiliate links. I bought the playskool walker that converts to a little sit upon car. My son who is 22 months now still loves it in both positions. It is really durable and easy to convert from one position to another. I’m always a fan of toys that grow with your child. I agree! Toys that grow with kids are the best! Would you recommend a push toy and an activity table? They seem like they are used very similarly. What is the difference if we are not to use the push toy for walking? Thanks! You are correct that they can be used very similarly. The thing that I like about the activity table is the ability to lay it flat on the floor or on a cushion, however you can do that with any other toy, it doesn’t have to be an activity table. Once your child is cruising they can cruise around the activity table. That’s really the main differences. In our house we actually ended up using our activity table more than our push toy. My son just wasn’t so interested in the push toy, he preferred to cruise the furniture. So if I had to choose one or the other I would have actually chosen the activity table, but this can vary child to child. Hope that helps! Thanks for reading! I dont hv a comment i hv more like a question..ummm my son is 11 months well he was supposed to be 11 months on d 29 but its a leap year n hell be a year this month…but my question is he is standing on his own without holding onn but not as stable but he falls in between sometimes n also he makes lilttle steps on his own..but i hv bought a pushtoy for him yesterday but i want him to walk before he reaches a year ..so my question is how long will i hv to wait before he finally start walking independly??? When a baby starts walking varies depending on the child. Generally speaking most kids learn to walk between 12-15 months with a range of 9-18 months!